Where do I begin to describe a home like this! AMAZING!! ELEGANT!! FUNCTIONAL!! TOP DRAWER FINISHES!! SUPER SPACIOUS!! ENTERTAINER’S DREAM!! LIGHT AND AIRY!! To name but a few superlatives!! 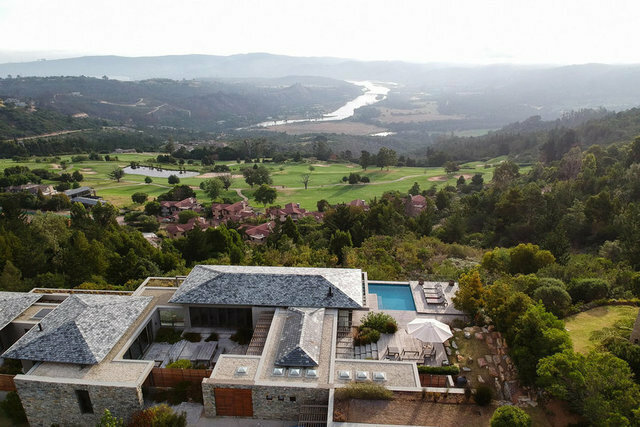 The magnificent views of the Knysna River and gorgeous hills which surround our beautiful Knysna to the Knysna Lagoon and Heads can be appreciated from almost every room in this well designed multi levelled home. A multitude of large sliders allow light from all angles and easy indoor/outdoor flow. The entrance to this charming home is inviting with a nearby large bar room plus conversation/TV area with sliders to the outdoors. The living rooms are spacious with sliders on both sides – one side to the pool and view, the other to the gorgeous entertainment area plus a series of well designed outdoor suntraps. The family room has a built in gas braai and fridge in a built-in cabinet. There is a good flow from the elegant lounge and dining room and well designed top quality kitchen with gas hob and under counter oven and many conveniences. All these rooms flow outdoors. From the kitchen is the laundry/scullery plus a unique storage area designed to house golf clubs which leads into a 4 car automated garage. Downstairs from the main hub to the sewing and study areas plus games room as well as the beautiful main bedroom with sliders to the view side and full en-suite bathroom which flows onto one of the northern suntraps. The lower level is home to three spacious bedrooms all with en suite bathrooms and large outdoor sliders PLUS a spacious guest suite with its own parking space and entrance, kitchenette and lounge area which forms part of a large bedroom and en suite bathroom. All this on a secure golf estate 10 minutes from Knysna CBD with its own pluses and has to be seen to be appreciated! !